Many citizens need education to understand raw public data, in order to put them in contest and to make informed decisions when voting or otherwise interacting with their representatives. Such education should of course start in schools and Universities. Even outside those environments, specific actions to make sure that as many citizens as possible have all the skills they need to really benefit from Open Data are necessary. Public employees also need to really understand the real nature and value of the PSI they generate or use every day, and how and why to make it open. 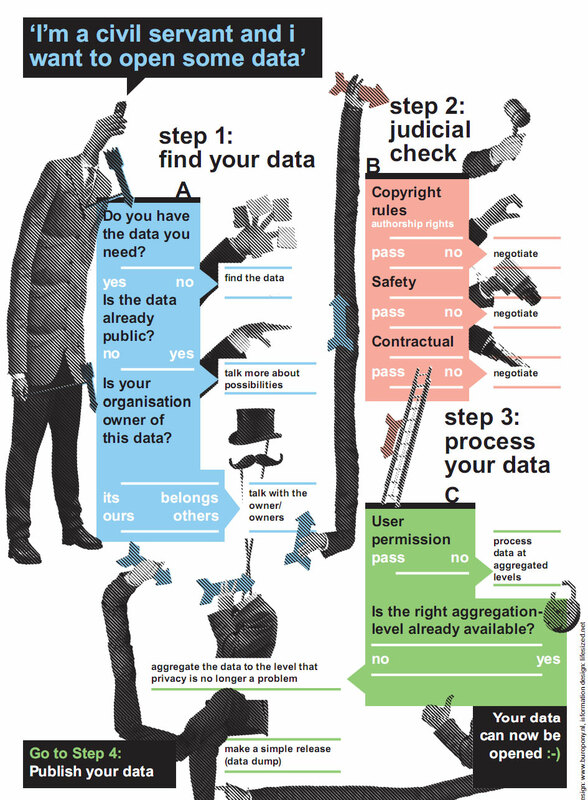 In this context it will be helpful to promote initiatives like the Open Government Data Poster, which tries to give an easy,visual explanation of the issues around open government data for civil servants. One last but crucial thing is to make sure that education to Open Data does not ignore adults and senior citizens, especially when they haven’t easy access to online services. The speech on building Britain’s digital future explicitly mentions the need to “put the 4 million people who are among the heaviest users of government services – but who have never used the internet – at the heart of our strategy rather than letting them literally slip through the digital net. Increasingly the digital net will be the social safety net – the only way to extend access to better services to all of our citizens”. Education to Open Data, or Open Data for Education? In the previous chapters we have discussed at length the fact that raw, Open PSI can help a lot to achieve real transparency in government and really participated democracies. We have also explained why this will really happen only if enough citizens not only have physical access to online open data, that is sufficient Internet connectivity, but also the right skills to make sense of the data they find online. There is also another side of the Education/Open Data coin. In all of this report we have shown how Open Data can be a really powerful tool to give more opportunities, at many levels, to… adult citizens. If we look at Open Data from the point of view of an educator, instead, it’s evident that they are also a wonderful opportunity to build more Open Educational Resources (OER), that is textbooks, exercise books and other courseware and to generally make teaching much more effective. Mentioning just one of many possibilities, once all the financial data we’ve mentioned so far are open, raw and linked it is much easier, and less expensive, to write accounting manuals full of very up to date exercises and examples from the same area in which the students live. For the same reasons, it is also much easier to build interactive websites or software programs that explain the concepts introduced in class by mashing data or let the students practice with them at home. Of course, making this happen requires (again) specific education for adults, in this case the teachers, to help them use these resources.